I know the peanut butter - chocolate parfait has been leading the poll this past week and it will probably win (it better win! I already bought all of the ingredients), so it might seem like a little too much PB & chocolate here on Paris Pastry. No way! There no such thing as TOO much PB & chocolate. Ever. Think of these drop cookies as a prelude to the poll's winner. 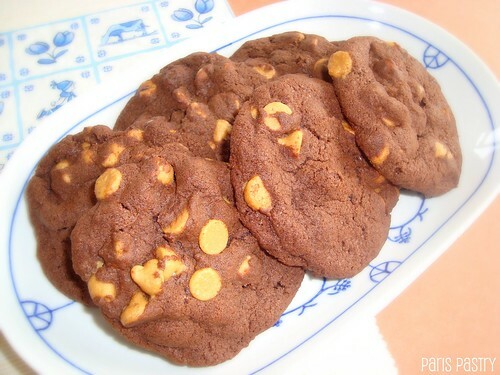 As far as their tastefulness goes, they taste waaay better than the Reese's Chewy Chocolate Cookies but not as mindblowing as the Peanut Butter Surprise Chocolate Cookies. Nevertheless, the peanut butter/chocolate combo never tires me so I rate them 4 out of 5. - In a small bowl, combine the flour, cocoa, baking powder and salt. Set aside. - In a large bowl, cream the butter, shortening and sugar until smooth, about 3 minutes. Add the egg and vanilla, and beat well. Add the dry ingredients and mix thoroughly. Stir in the peanut butter chips. Drop by rounded teaspoonfuls onto ungreased cookie sheets, leaving several inches between for expansion. Sprinkle lightly with the sugar. Place the cookie sheets in the refrigerator and chill for 20 minutes. - Bake for 10 - 12 minutes. Cool the cookies on the sheets for 5 minutes and then remove to a wire rack to cool completelty. Ooh, I almost forgot: Happy Thanksgiving! These looks so good! They look like they have been baked to perfection as well..not too crispy! Now I just need to find peanut butter choc chips.. I have made a few like these before..so very yummy! Hope you have been enjoying my coverage of the Chocolate Fashion Show in NYC, it was so amazing! Have a great weekend! !